My artwork is an evolution of my creative journey combining my passions for drawing, designing, and painting with my love of colour and texture. Beginning at an early age, with my mom helping me sew little felt outfits for my puppets, which expanded to knitting, crochet and embroidery. I loved drawing and colouring as a kid and spent a lot of time sewing my own ﻿clothes﻿. As a young child we spent a lot time in the summers camping and I would spend hours beach combing looking for the perfect sand dollar buried in the sand. As a teenager I focused on drawing and went to college art school in the summers. A few years ago I completed a certificate in Professional Graphic Design. I love the creativity in creating logos. I am a co-creator of UVic's self-guided Campus Art Tour. Read more here. My inspiration is found in the natural beauty of the West Coast of Canada where I refuel my creativity and find inspiration by spending time in nature, walking my golden retriever along the many beaches and forested walking trails. In my spare time I enjoy watching documentaries of famous artists and musicians; visiting local art galleries and museums; and of course my passion: creating colourful artistic expressions of art. 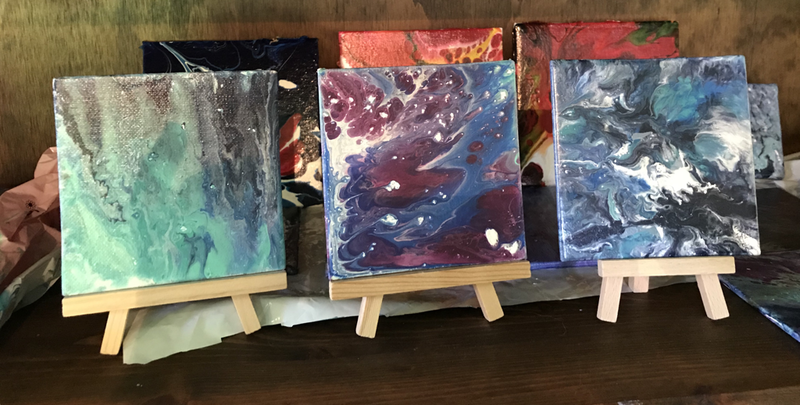 I recently decided to take some time to experiment with a new painting technique, paint pouring and I am totally addicted! Fascinated by the flow and mesmerized by the blending of the colours. Pushing and pulling the paint with a little tilt of the canvas, letting go and letting gravity do its thing. “I have an idea of what I am going to paint and of course, I don't paint it, that is true art. When the painting surprises the creator, when the performance surprises the performer, that is pure art. True art is always a surprise, it is not constructed. Art always has to be a surprise.” -John Cougar Mellencamp. Plain Spoken.